I have been covering watches professionally for a little while now. From a technical standpoint, the watch was nothing exceptional – interior is an ETA 2892 using a dubois depraz chronograph module put on top. But what made this watch so great is that nobody saw it coming – honestly nobody noticed ANYTHING coming from Tudor at the point – and it reflected what Tudor does best – incredible, forward thinking style with well-made basics at a affordable price. An individual might think that adding a strap such as this is not a big deal – after all you can buy NATOs online for under $10 – but what this backsplash represented was the very first time that it was abundantly clear that a significant watch firm was paying attention to what real collectors were doing, and also what they actually wanted. And also to include this little piece of nylon in with the amazing Oyster bracelet was compelling something that was something of a cult thing (I would venture to mention 90% of people you meet on the road haven’t seen a watch on a NATO strap earlier) into the masses, but in their own manner – that the Tudor nylon strap is not a NATO whatsoever, it is a single piece that isn’t meant to be folded with two sewn in spring bar loops, made at a legendary mill in France that also generates ribbons and straps for everybody from Chanel to the Vatican. 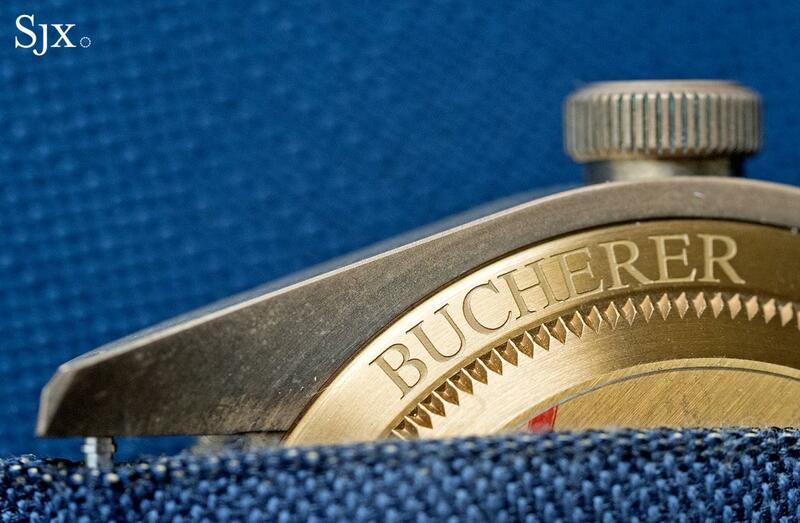 Bucherer is one of the Europe’s biggest watch retailers, and reputed to be the continent’s biggest seller of Rolex. With its 130th anniversary coming up in 2018, the Swiss retailer unveiled over a dozen “Bucherer Blue” special editions created just for the occasion. 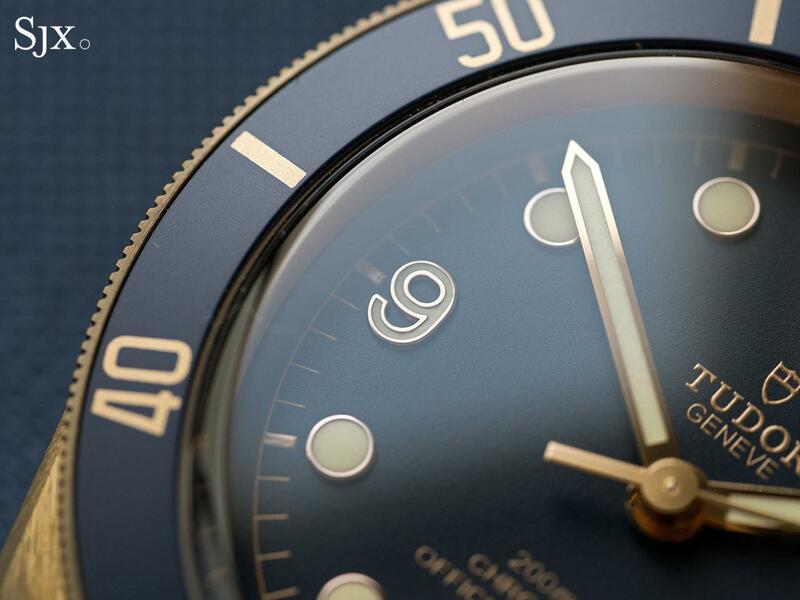 One of the most affordable, and perhaps the most compelling, is the Tudor Black Bay Bronze Blue. Announced in May 2017, the Black Bay Bronze Blue Bucherer is Tudor’s first retailer-exclusive edition (though according to those in the know, not the last). Thanks to a gentleman in Geneva and accommodating Bucherer store manager, I managed to land one a few days after the launch and have been wearing it for much of the last seven weeks. 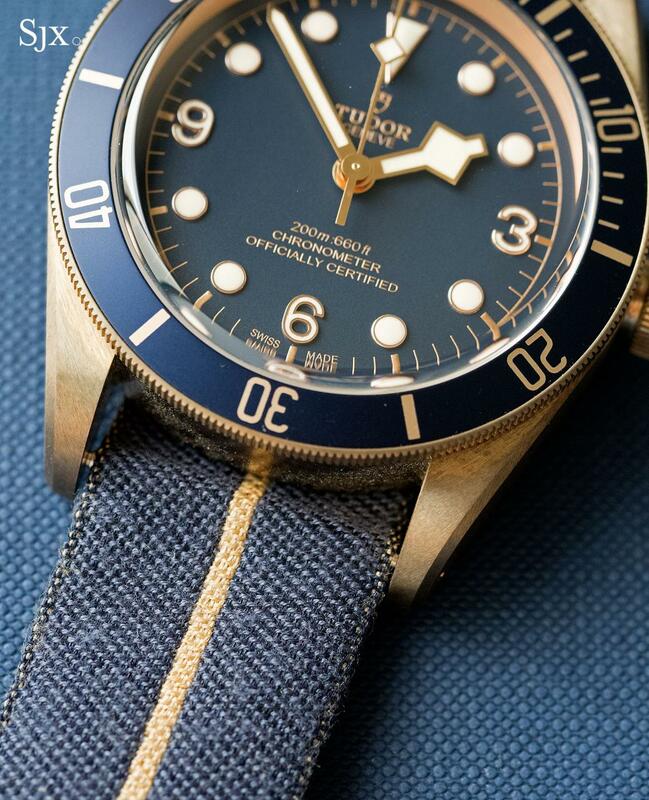 As with all of Tudor’s Heritage watches, the Black Bay Bronze Blue a lot of watch for the money. For just under US$4000, you get a solid, proprietary movement inside a well made case in the material du jour. And of course the bonus of an uncommon colour palette in “Bucherer Blue”. When the ordinary Black Bay Bronze was introduced last year, I found it an appealing proposition at just the right price. 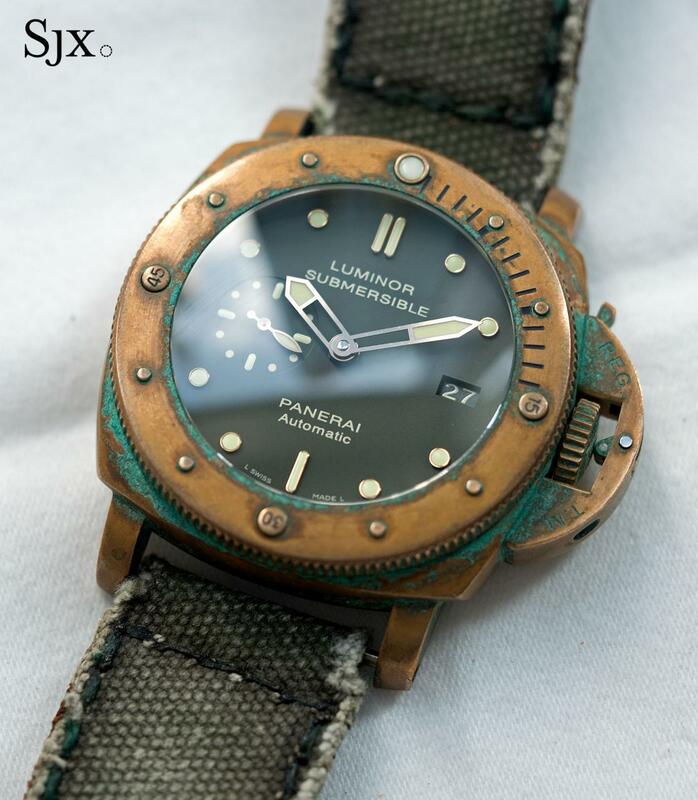 Higher-end bronze watches were mostly overpriced for what they were, while more basic offerings were, well, basic, mainly ETA movements inside inexpensively made cases. 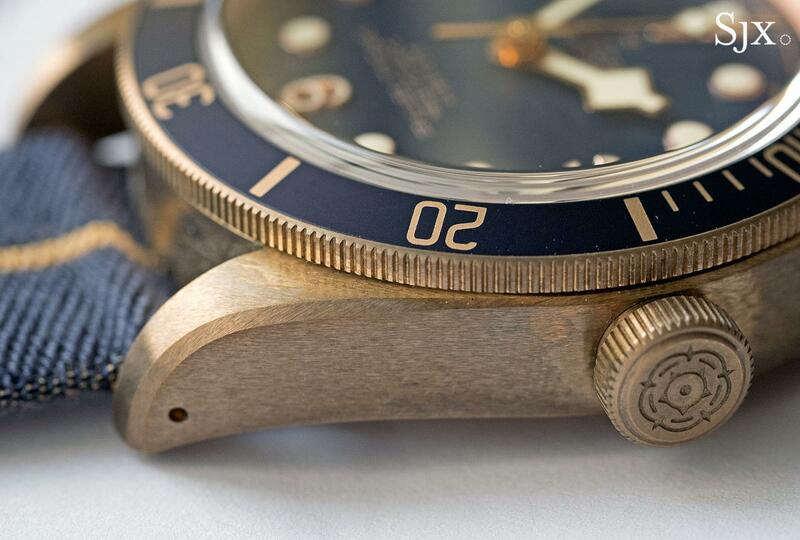 But I didn’t cross the Rubicon for the Black Bay Bronze for two reasons. One was the brown dial and chestnut bezel, both of which are too similar to the colour of the case, especially after the bronze darkens over time. And the second factor was the colour combination lacked of contrast against East Asian skin (I am of Chinese descent). 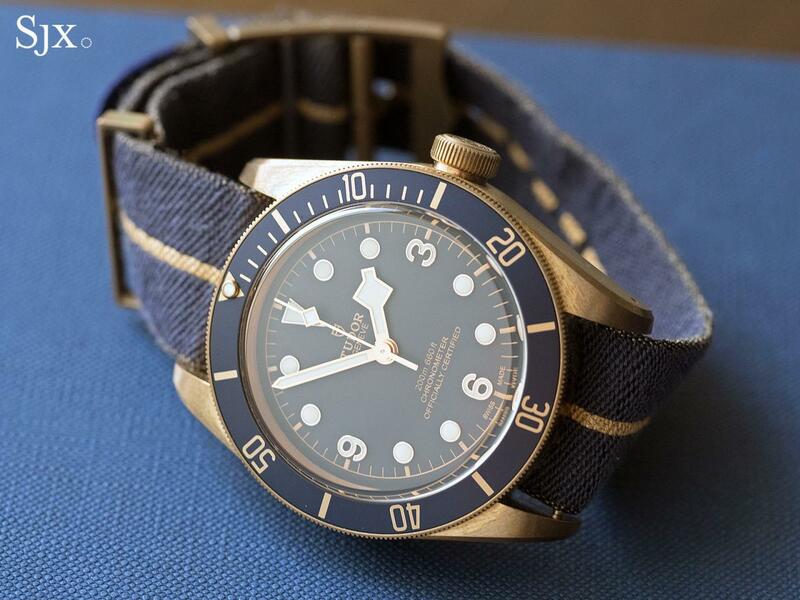 So the Black Bay Bronze Blue hit the mark. It’s a handsome combination. 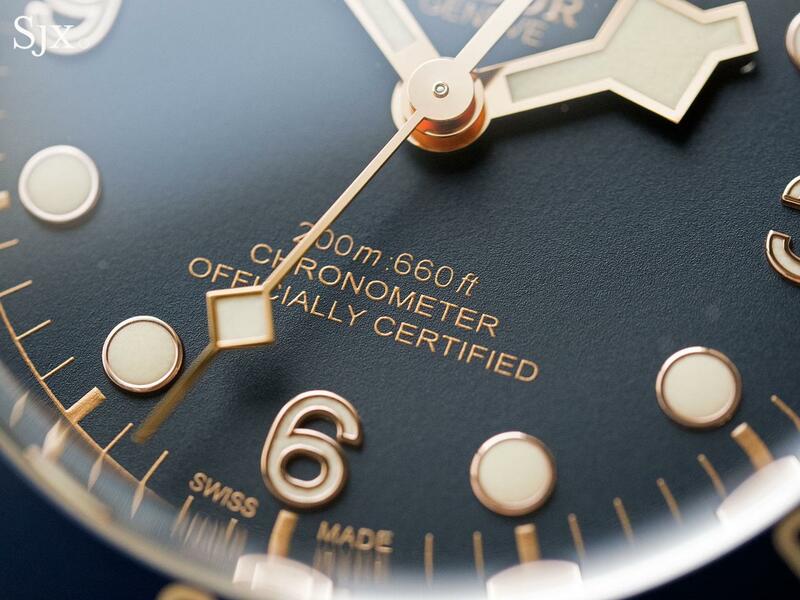 The “Bucherer Blue” on the Tudor (it is not the same across all the Bucherer editions) is a dark shade of the colour, which works well with the granular “gilt” print on the dial. If there is one nit to pick with the dial, it is the plain, sans serif font used for the lettering. Given the vintage inspiration behind this watch, and the entire Heritage line in fact, a serif font would have been more fitting. 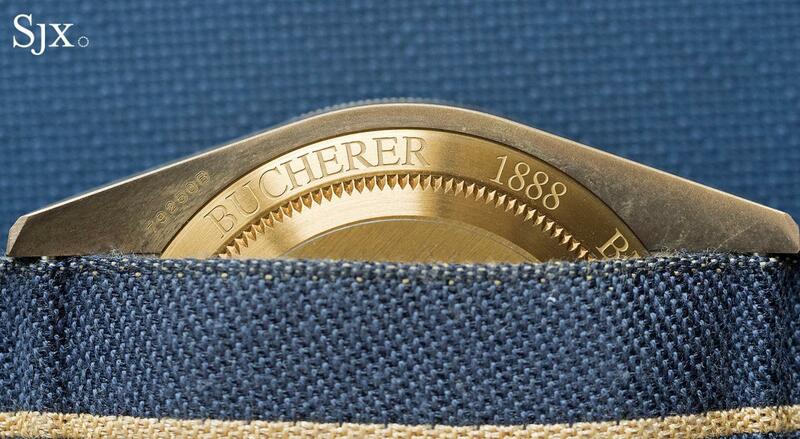 On the subject of colours, the fabric NATO-style strap created for the Bucherer edition is an absolutely perfect fit. A slightly dirty blue with a dark yellow stripe running down its centre, the fabric strap echoing the colours of the case and dial just right. The package also includes a brown leather strap that’s identical to that found on the regular Bronze model, but not quite a good fit for the blue version. 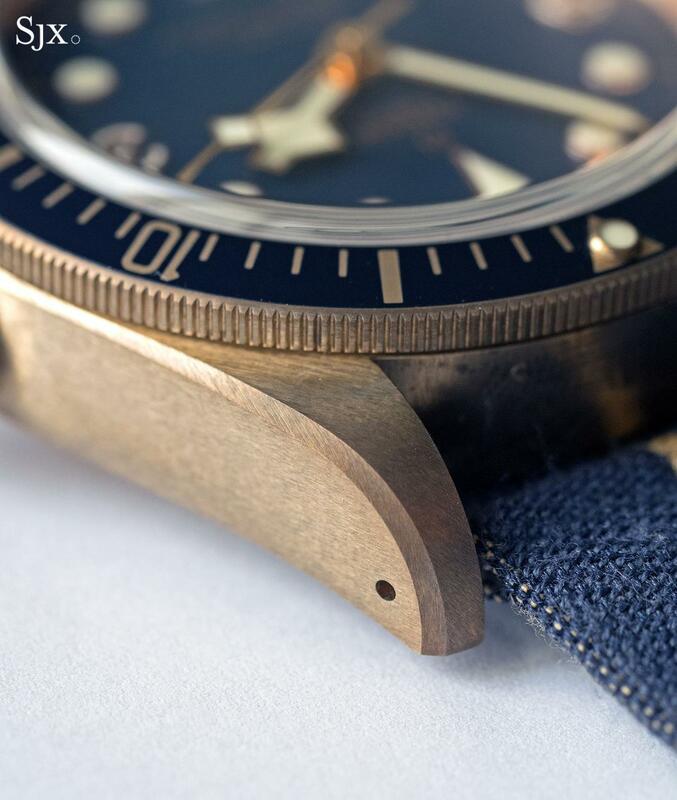 The only downside of the strap is that it tends to stretch over time, becoming longer and narrower, which creates tiny gaps between the strap and the lugs. Besides the colour and commemorative engraving on the back, the watch is identical to the stock Black Bay Bronze. So it’s a largish watch, 43mm in diameter and bigger than the other dive watches in the Heritage line (which are mostly 41mm). The increased size is hardly apparent though, perhaps because of the muted, oxidised case colour as opposed to the polished steel of the typical Black Bay. Where the size is a slightly disadvantage, and the same holds true for the other Heritage watches, is when the watch is on the fabric strap. The softness of the strap means there’s always a bit of give, even when the watch is worn fairly snug. The patina on the case develops quickly, especially in the second and third week of wear. Being a bronze alloy with a significant proportion of aluminium, the patina is brown, darkening the colour of the case, rather than changing it. That’s unlike the conventional bronze alloy used for watches, which has copper as the main alloying metal, resulting in a green patina. The sunken treasure look has an unique appeal but it’s definitely not for everyone. When the watch is unworn and the case unoxidised, the case colour is almost indistinguishable from the case back, which is actually PVD-treated steel since bronze can cause a rash. Over time the disparity quickly becomes obvious, illustrating the extent of the oxidisation on the case surface. Because the patina is the result of surface oxidisation, it tends to slow down or halt after most of the surface is covered in an oxide layer. The patina on the watch pictured here is likely the greatest extent of the patina, having changed little after the first three weeks or so. For those so included, cleaning up the patina is fairly easy: soaking it in an acidic liquid like lemon juice or vinegar eliminates most of it, except in the hard to reach corners. 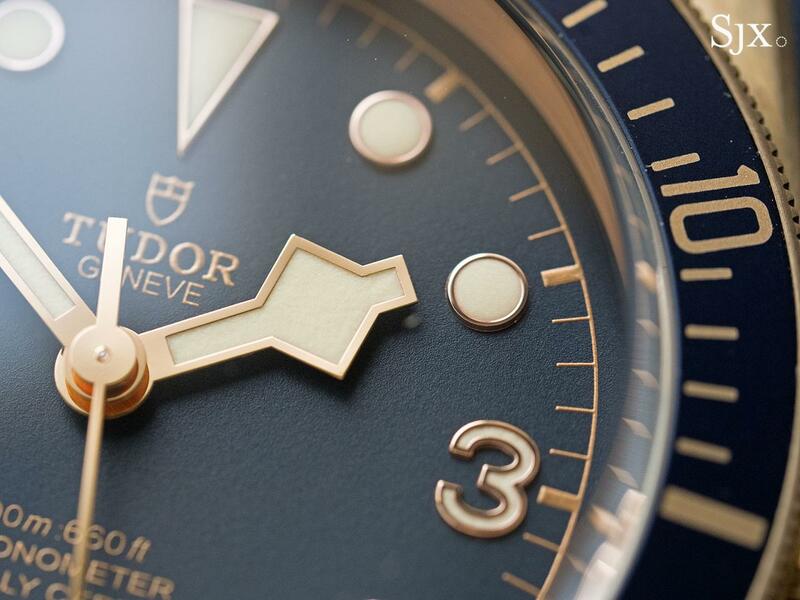 And Tudor itself can clean up the watch with professional, but abrasive, polishing. The movement inside is the in-house cal. MT5601, a robustly constructed but functional looking movement. It has several notable features that Tudor touts in the specs, including a silicon hairspring and COSC-certifiation, but the most useful feature is the 70-odd hours of power reserve. That allows the watch to keep the correct time even if it’s off the wrist for a few days, as is usually the case for anyone who wears several watches in rotation. 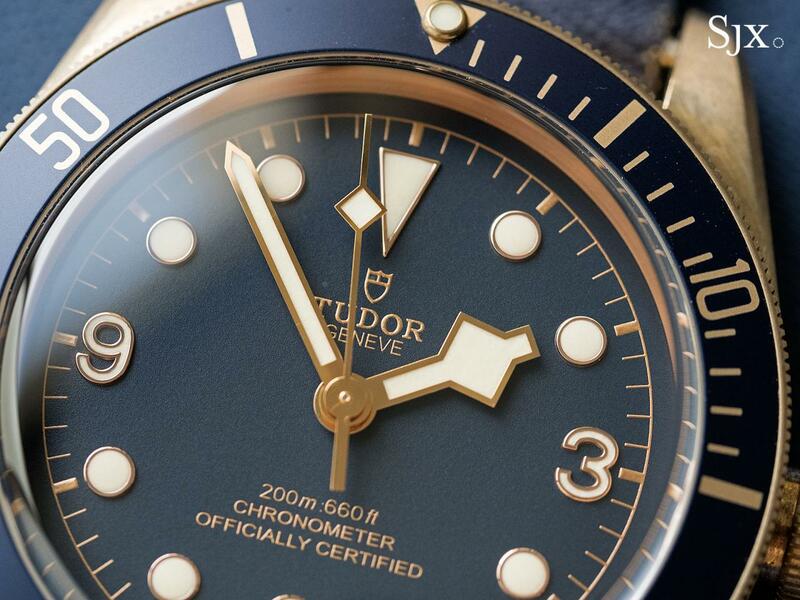 Tudor’s Heritage watches are bestsellers, so they are widely encountered. 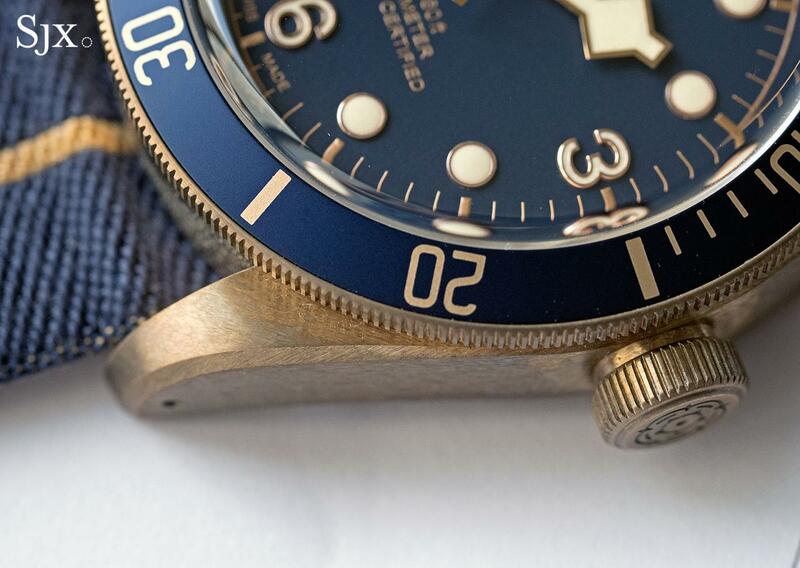 A big part of the Bronze Blue’s cool factor comes from the fact that it’s a retailer-exclusive. Despite being relatively inexpensive, the Bronze Blue is scarce, which is a plus. 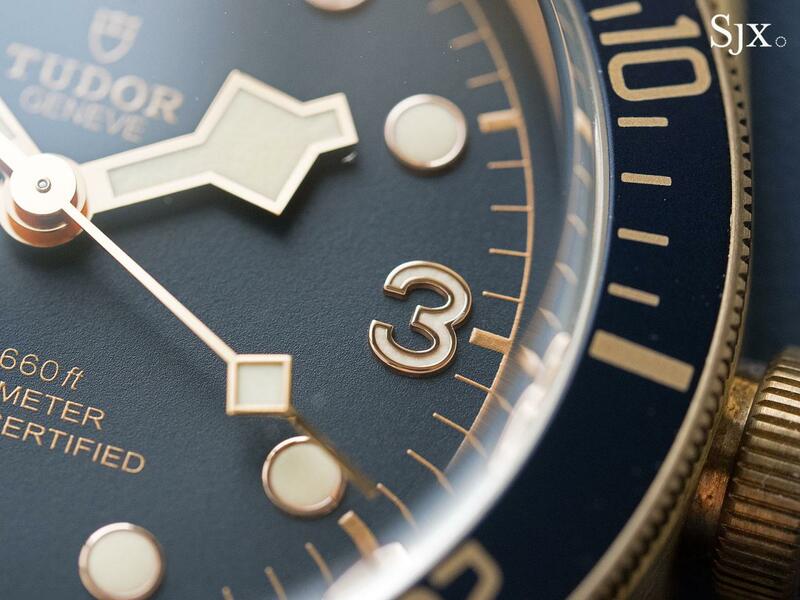 Notably, the Black Bay Bronze Blue is the only retailer-exclusive model to date. Tudor doesn’t do limited editions either, with the exception of the 50-piece Black Bay “L’Italiano” for watch forum Orologi & Passioni. That will change as other retailer-exclusive editions are already in the pipeline, but as long as such collaborations are done in prudent numbers they will remain novel and desirable. The watch industry has already been learnt its lesson from the dozens and dozens of nearly identical boutique-only models produced by Panerai and Audemars Piguet starting in the late 2000s, which were “special” editions until they weren’t. The Black Bay Bronze Blue Bucherer costs SFr3800 or €3730, including local taxes, exactly the same as the ordinary Black Bay Bronze. It is only available at Bucherer stores, located mostly in German, Switzerland, Austria and France. While supplies are somewhat scarce at the moment, the Black Bay Bronze Blue is not a limited edition, and will be available until at least mid-2018 when Bucherer celebrates its 130th anniversary.